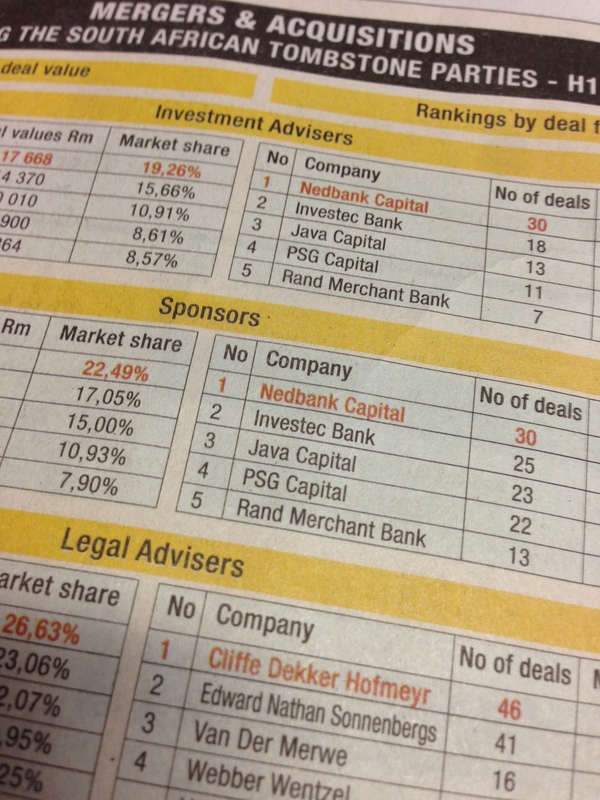 We would like to take this opportunity to express our appreciation for your valued support and to proudly announce that we have just been ranked 3 rd for “Mergers and Acquisitions by deal flow” and 5 th for “Mergers and Acquisitions by deal value” in the whole of South Africa by “Dealmakers” in their latest publication in their legal advisors category, with an aggregate of deal values for 2013 this far, exceeding R5.9 billion Rand. 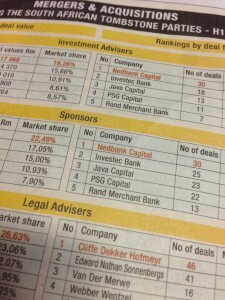 “Deal Makers” is an independent publication, which is widely recognized as a leading publication regarding mergers, acquisitions and corporate finance activities. Once again this achievement would not have been possible without our clients’ trust and instructions. We value their support and we will continue to use our best endeavors to add value to their organization and aspirations.